Thought you were going to get a truly confessional post, there. Naughty, naughty. "Lady of the Evening," I understand, is the name of this plant. Pretty Lady is inordinately fond of hers, both for thwarted maternal reasons--she grew it herself, from a cutting, given to her last May--and because it is so very strange. She finds herself hovering over the windowsill at odd moments, wondering what it will do next. This plant is said to produce large, exotic blossoms which open only at twilight, hence the name. Mine has shown no sign of coming across with the goods, thus far. If anyone out there has a notion of how to encourage it, I am all ears. Hey Pretty Lady, does that plant have a scientific name? We have three greenhouses - including one housing nothing but orchids and ferns - and an extensive library on botany. If you can give me the proper name of it, I'll be happy to peruse our technical manuals and provide you with what info you need. Morgan--I am sure the plant has a scientific name, unfortunately I do not know what it is. I think it is from Peru; the friend who gave me the cutting obtained hers from a friend who smuggled a leaf into his luggage while visiting South America. I believe my mother may know, however. Her father was a florist. I will get back to you. Three greenhouses. My. You have no idea how I envy you. I'll show Larry the picture in the morning. I'm quite sure if he can't identify the exact plant he'll know what family it's from. He's got a crazy encyclopedic knowledge of plants and animals. If nothing else, I have a botanist friend who works at the university. I can email him a pic and see if he can identify it if Larry can't. Yes, the greenhouses are nice but so much work. The orchid greenhouse is attached to our master bedroom. It's so sweet. I'm pleased to inform you that my Horticultural Knight in Shining Armor has come to your rescue. successfully identified your plant before the picture even completely loaded on my slow dial-up connection, know-it-all that he is. The genus is Cereus, and the more common name for plants of the Peruvian species are Orchid Cactus or Night-Blooming Cereus, Chalice Flower and Queen of the Night. They do have lovely blooms that can be very fragrant and up to 7" wide. But it appears that you'll have to wait a bit longer to see them. Cereus only bloom in the second year. Larry said be sure you don't overwater it, but added that yours looks happy and healthy so just keep doing what you're doing. Good luck and please post pictures when your Lady of the Evening is ready to grace you with blooms. Bless you, bless you, bless you and Larry both. I'll keep on. It's so cute. I have always fantasized about an orchid greenhouse attached to a master bedroom--actually, a combination orchid greenhouse/hot tub/sauna room attached to the master bath. Round, with tub in the middle and benches round the sides, with a stained-glass roof and orchid containers under the eaves. That would be nice, but our orchid room is too small for a hot tub. I plan to move some plants and put a wicker chair in the corner, with a little table for books. Our orchid greenhouse is actually built around what used to be a patio. Larry framed it in two years ago and covered the sides with twinwall. So far, the day I enjoyed it most was the day we had a rare snowfall. It was almost surreal to stand in a room full of all those blooms and see the snow outside. I'm glad we could help with the plant. Larry said to tell you that as it gets bigger, you might want to upgrade it to a hanging basket. Apparently that's how they prefer to live. My eldest brother gave me clippings from this plant. I had it in water while it grew roots and now I have it in a beautful large pot. It can be planted in the ground in warm climates. The flower is incredibly beautiful and unique. I can't wait to see the flower again. It's too bad that a photo cannot be posted here. I also have a photo of it because the flower was so beautiful. 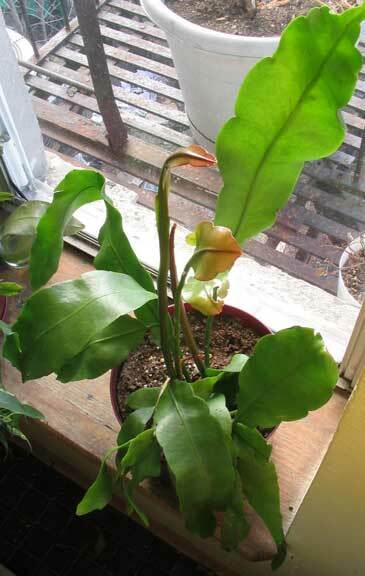 It seems to be a pretty hearty plant and grows pretty fast. It likes warm climate and I keep it outside in a shady place that gets sunlight but I noticed the leaves burn if the sunlight is too direct. It seems happier in its new spot. It also should not get too dry. My plant has been growing quickly and tonight, two blooms will open at one time. One bloom opened last night. I have been taking photos like crazy because the flower really is spectacular. Your plant will give flowers...just give it time. And you can also add some regular all purpose plant food to help it along. I add a little once a month.